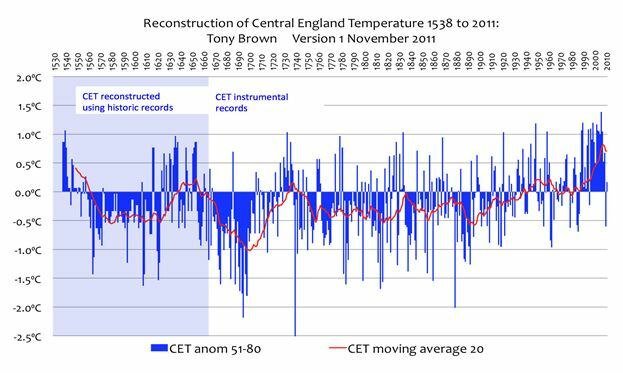 CET & And The Bit The Met Office Don’t Want You To See! The Met Office show the above graph in a prominent position on their website, showing how Central England Temperatures have changed since 1772. The climb in temperatures in the last couple of decades of the 20thC stands out, albeit with a decline since. Yet the CET dataset actually starts in 1659, so why don’t the Met Office show the whole series? Could it be they don’t want you to see that there was a much bigger and steeper climb in temperatures in the early 18thC? Could it be they don’t want you to know that the temperature in 1733 was within a whisker of the record set in 2006? Could it be they don’t want you to realise that the average over the last 5 years is actually less than it was in the 5 years leading up to 1730? I wonder what else they don’t want you to know? This is exactly the sort of thing that shows them up. If they didn’t have an agenda, they wouldn’t mind showing the whole series – in fact, they’d want to because having data from 1659 is quite impressive. It shouldn’t matter what the data shows. I guess we’ll know when the adults are back in charge when they start showing all they have and not just some of it. They destroy their own credibility, their own trustworthiness, by cherry-picking the data. …but only when it is exposed. I guarantee you they would stop you from blogging if it were in their power. The reason they attack “deniers” is because they are left naked and exposed by this type of work. You keep turning over rocks, you keep finding slimy, ugly, stuff like this – you’ve proven they have torn the public trust to shreds. The government funds the Met Office to deceive us??? Additional info before instrumental records is being compiled by tonyb. He mentioned this at 6:26pm in a comment on Judith Curry’s site on her “week in review’ post of 03/29; in a reply to Scott. I wonder if as many species became extinct during the four decades from the mid 1690s when the mean temperature rose by 2K, that present-day doom-merchants’ models predict will become extinct if our current temperature rises by the same amount? The UK’s population thrived – 1700=6,045,008; 1750=6,517,035. And local food supplies expanded accordingly, to support this population growth. Evidence perhaps, that a warmer world would be beneficial to mankind? I think we need to bear in mind that, like all organisations, the MET office has a PR/marketing department that is separate from its meteorologists. As an engineer in a large company I almost always cringed at what our marketeers said and wrote. There is probably not a conspiracy to mislead, more likely a desire to big-up the impact of the Met Office, and we all know what most people are interested in. But, hope you keep up the good work here for those who want to dig deeper. Maybe I am an ethical stickler, but when marketeers spread ideas and summaries that they know are not true so that they can “big-up the impact” then that is, by definition, “a conspiracy to mislead.” We have gotten so inured to people in positions of authority lying (there, I used the “lie” word!”) that we give them a pass merely because we see that they have lied for some definable reason. We say that they have “slanted things”, that they have “spun the facts”, that they have “misrepresented the case.” Those euphemisms cover the sad fact, they are lying. Just because we can empathize with their desire to “big-up the impact”, that does not mean that they are justified in their actions. Admit it: they actually ARE conspiring to mislead. “Lie” means something very specific. To state something untrue with the intention of deceiving the listener or reader. The Met has intentionally deceived without lying in this case. The data are true and are not falsely represented. But the data-set chosen was chosen specifically to exclude the 1690 – 1730 data which would have revealed the 1960 – 2000 rise in temperatures was not unique. The bad part about lying is its end; deceiving. We have been deceived and that’s bad. I would respectfully disagree. The dictionary I just checked has nine different variations of meaning, among them “something intended or serving to convey a false impression; imposture”. I would say that the action of presenting a truncated data set when the full set is a more accurate example of past trends would qualify under that. Still, that is — to me, at least — a minor semantic point and I wholeheartedly agree with you when you say “The bad part about lying is its end; deceiving. We have been deceived and that’s bad.” Absolutely correct, and we need to point out that deception in clear and unambiguous terms. This is part of a deception that has the potential to impoverish literally billions of people. To be fair, the graph states that the series is based on Parker et al. (1992), which is essentially a daily series that required more precision than was available before that point. The series since 1659 is from Manley (1974). By its own admission, it contains some non-instrumental data and actually contains some instrument data from Utrecht (Labrijn, 1945) to fill in the gaps! Could it be that the UKMO is using the series from 1772 simply because it’s more reliable? That would be giving them the benefit of the doubt. The demonstrated rise in temperature 1960-2000 only appears unique if you use what you have referred to as Parker series. The Manley series is reliable enough for this demonstration. Why not do like Paul has done? Use them both. Show us everything. Mention your concerns about the reliability if you have them. No I don’t think there is reasonable doubt here. I would vote to convict them of deliberately deceiving us and deliberately choosing the Parker series to do it. They also show the HADCRUT graph back to 1850, even though most of the world had very little data in the 19thC. That did not seem to be a problem for them.